P&O Cruises | Frequently Asked Questions | Before You Sail - What is Cruise Personaliser and what can I do on it? You are here: Home > Advice centre > Making Reservations > What is Cruise Personaliser and what can I do on it? Q. What is Cruise Personaliser and what can I do on it? The Cruise Personaliser is an online tool which is available 24 hours after a booking is confirmed. These can be found in the 'Getting There and Back' section of the Cruise Personaliser. Please note, the pre-purchase window closes 3 days prior to sailing. After this time, all further bookings, modifications and cancellations must be handled on board. 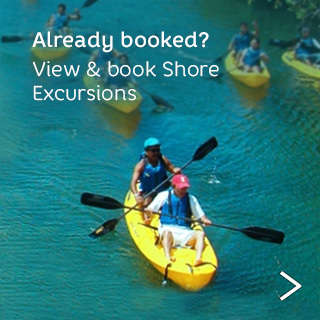 How do I book Shore Excursions online? Why am I unable to access Cruise Personaliser? What information do I need to enter into the Cruise Personaliser? I have been indicated as not having a middle name on my Cruise Personaliser how can I amend this? Why do I get an error when entering my personal details on Cruise Personaliser?